Last weekend we took a family stroll down South Congress (one of my favorite spots in Austin) for my daughter's birthday. I mentioned on Instagram how glorious the weather was and that we planned to spend most of the day outdoors. I wanted my chosen outfit to match my mood; bright, airy and full of spring colors. Even though there isn't anything earth shattering about the style I put together, it's one of those looks that just works time and time again. It's casual, comfortable and sings a springtime melody. 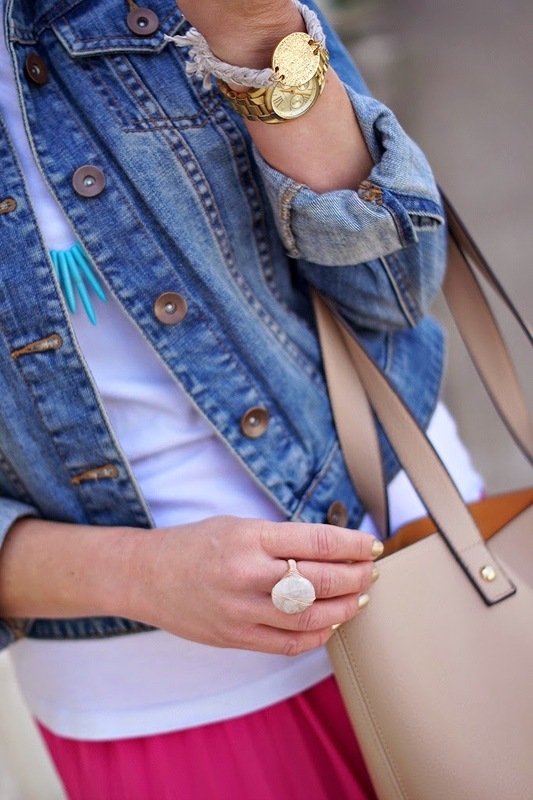 Sometimes I forget that it's okay to throw on a white tee, solid skirt and denim jacket to keep things simple. By adding a few accessories that compliment the colors in your outfit, you can really finish off a look and make things come together in an effortless fashion. I have to mention this pleated maxi skirt that Love Shopping Miami sent to me. I predict this little number will get lots of love attention over the next few months. The best thing about it besides it's length and color? It is fully lined. It is a pet peeve of mine when the lining in maxi dresses or skirts stop at the knees and the rest of the bottom is see through. This one got triple points for being the opposite. It is on sale now, but there is only one size left and the size I am wearing. It's the perfect piece for both spring and summer and I highly recommend it. I opted not to wear the belt this go around, but plan to wear a tank tucked in next time. In other news, I am heading back to L.A. tomorrow for LuckyFABB. To be honest, I haven't planned a single outfit and didn't really go shopping for the two day conference. I just can't get it together, but know that procrastination works in my favor and it will all come together in the end. I can't wait to see my two roomies Jenn and Stesha and hug so many ladies that I feel like I have known for years because of blogging. Let me know if you plan on attending so we can meet up! I haven't been before, but hear it's an amazing time and a great networking experience. Plus, Nicole Richie is going to be one of the speakers. I cannot wait to see and hear what advice she has for all of us. After the conference I am staying with one of my best friends in the entire world and plan to decompress with a little girl time and a late night chat session. Make sure to follow me on Instagram if you are interested. I will do my best to not be "that" girl and post ten times a day, but I can't make any promises. What a great skirt! Enjoy your time at the conference. One of these days, I would love to attend especially and enjoy CA! I love this outfit! Sometimes it it good to just be "casual" and make your outfit simple. But this skirt is too perfect for words....I need it lol Have fun at the conference!! That skirt is everything, I am planning on going to Luckyfabb in september. Have fun and cannot for your ig post. LOVE this skirt! I image it's quite versatile even with it's bold color! Great skirt! I've never felt like I could pull off a maxi skirt or dress, but I would definitely give this one a try. It's beautiful and I love how you've styled it. Beautiful skirt. Love that you dressed it down with the jacket and tshirt. And I'm totally with you on the lining- it needs to go all the way down! I LOVE that color of that skirt. That shade always looks fantastic on you too! Have so much fun at LuckyFabb!! I agree...this is an outfit you can wear over and over again. I LOVE this skirt!!! Have the best time in LA...I can't wait to hear all about it! Love that maxi and color! Have fun in LA! The pink skirt is stunning! Just love the simplicity of this outfit with an eye catching pop of color. Ooh, it is sooo tempting to get that last skirt on their site. I love Love Shopping Miami! Have fun at LuckyFABB. It sounds like so much fun!!! I too can't stand the skirts that are see through! Such a bummer when they turn out to be only half lined! You'll have a great time at Lucky FABB! Great learning and networking experience!! Have fun!! This is one of my favorite outfits! Simple, but still well put together and I love the accessories!! Can't wait to meet you at Lucky Fabb!! I am so excited!! I'm so jealous! I would have loved to have gone this go round. Fingers crossed I can go to the next one in NYC! Have fun! I won a giftcard to Love Shopping Miami and this skirt has been in my cart since I won it! I keep waiting to see what they have for spring before cashing in on my prize. You make it look good! That outfit is killer! Love the pink skirt with the sunglasses! I really love your pleated maxi! Such a vibrant color! And I can't wait to hear more about your adventures at LuckyFABB! You look gorgeous and styled this look perfectly!!! That skirt is so pretty.. Truly one cheery Spring look Shanna....welcome to LA!!! I so wish I could rock a maxi. You look fabulous. Oh, I so agree with maxi skirt lining! Just make them match! haha I really love this look, I know it's simple, but it's classic and beautiful! I personally love the laid back look. It's the less is more approach. And look at you and your Cali travels! I hope you have an awesome time and I would love to know how you prep to go to LuckyFabb! 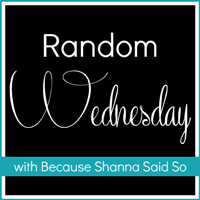 Like what do you always bring to blog networking events and how do you get over the initial awkwardness of meeting new people? I would love to hear your tips! That skirt!! I used to have one similar but it took a trip to the consignment shop and I have been on the lookout for a new one! LOVE the skirt, you look fabulous! And that redic half lining is my pet peeve too! Can't stand it! Have fun in LA! I love this outfit! It is simple, but so so cute. I love the pleated maxi. And I am super jealous you are going to LuckyFABB! I really wanted to go, but I wish they would announce them earlier so I can try to save my $! Maybe in the fall :) Have so much fun! I love how you paired the pink and turquoise together! I'll have to try this with my pink maxi when it's warm enough here :) Have an awesome time at Lucky FABB! this skirt is so lovely on you! You have the prettiest jewelry! Love your nails as well! I went to UT for college and miss Austin! Cute outfit! I like the mix of pink with turquoise. This is a great look! I have a similar F21 tote and I love it. Have a great time. Can't wait to hear all about it. Great skirt! Love it, especially since it's fully lined! I absolutely LOVE this outfit!!! This is something I could wear every day! Loving the pink maxi!! I am so into maxi skirts it's not funny. I have a few that I'm waiting for in the mail as we speak. It's such a simple and stylish outfit! The pink skirt is lovely. Love this outfit! The skirt is a perfect shade of pink and a white tee is perfection! You look gorgeous and I'm excited to follow along on your adventures to LuckyFABB. And no worries, I will be the girl posting 10 times a day about the conference in Kansas City lol! I love the whole look. Very pretty skirt. To me this is just a perfect spring look. 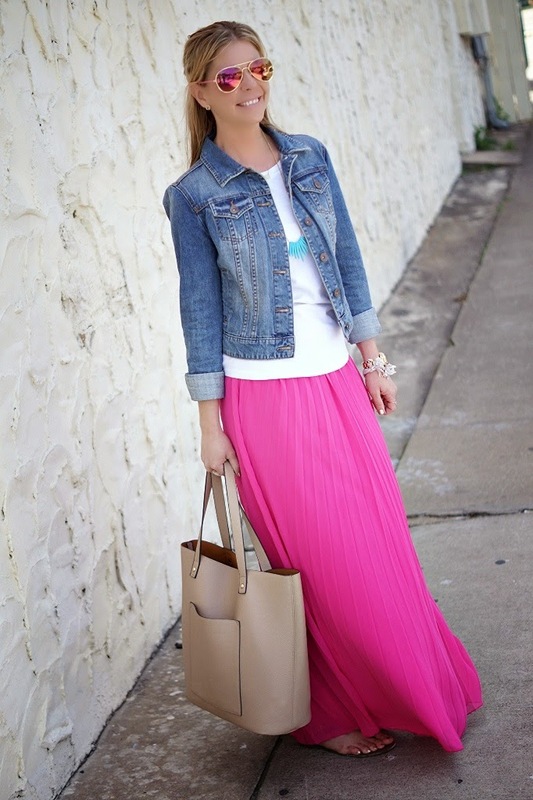 LOVE the pink maxi skirt! Loving your maxi and necklace! That skirt is so pretty! I love it! Very pretty! Have fun at in Cali! South Congress is so fun! Love this look, easy breezy! Have fun in LA again!! Loveeee this look! So jelly you're going to Luck Fabb! I've been dying to go :( maybe next time when I don't have little ones attached to me! Jealous you are going to Lucky Fabb! I thought about it but couldn't make it work this year. Maybe next time!! I love the skirt. You look so fresh and pretty! 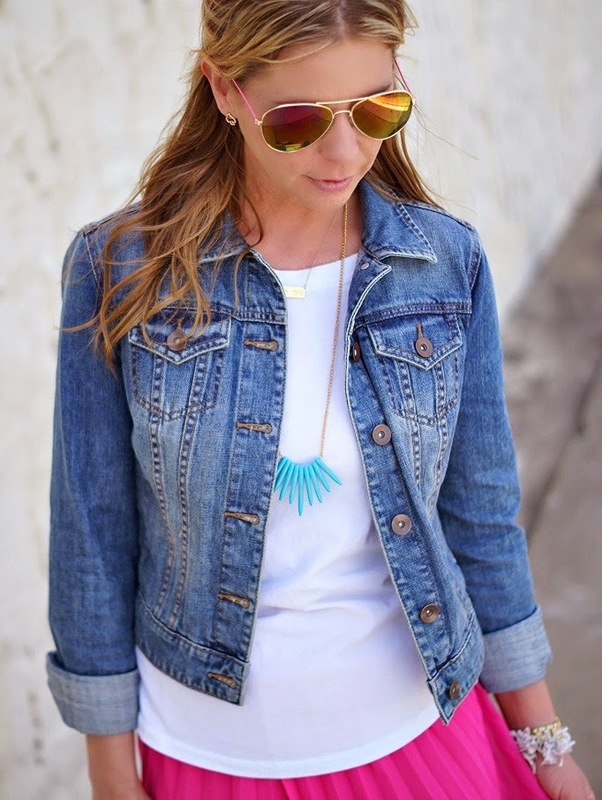 Love your aviators and your beautiful ring! Okay I know I said yesterday your outfit was perfect for a vacation, but really THIS is. How do you do this!?! So adorable, miss Shanna!! 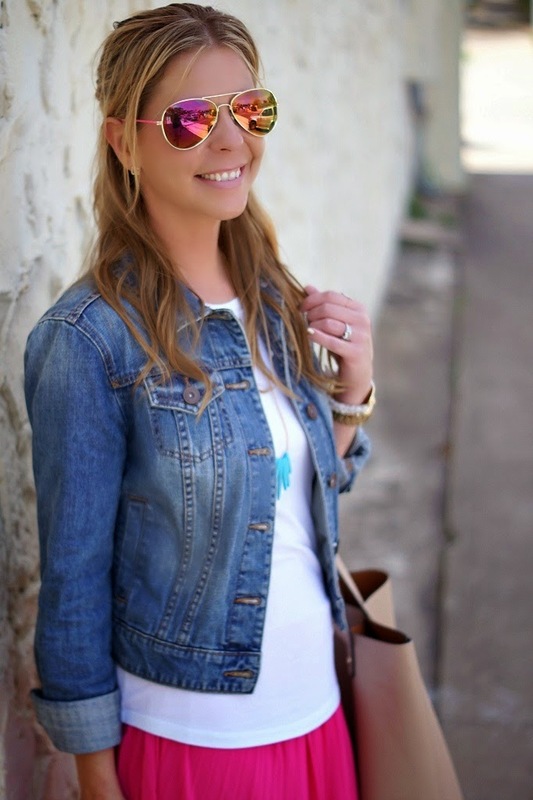 this is such a fun look Shanna! I love it! Love Love LOVE that skirt! Such a fun color. Thanks so much for sharing! A pleated skirt is just too fun! So glad to hear you're going to Lucky Fabb! I hope to meet you! This has given me an idea for what to wear this weekend. I just got a coral maxi and already have the rest. Perfect combo! Happy birthday to your daughter! I'm glad you are having beautiful weather! It's finally starting to get there for us here in Boston! And I love everything about this outfit! This is such a great look! I couldn't do the pink (we all know I'm not a pink girl), but it looks perfect on you! So peaved that this is sold out, I love the pleats and the bright color!